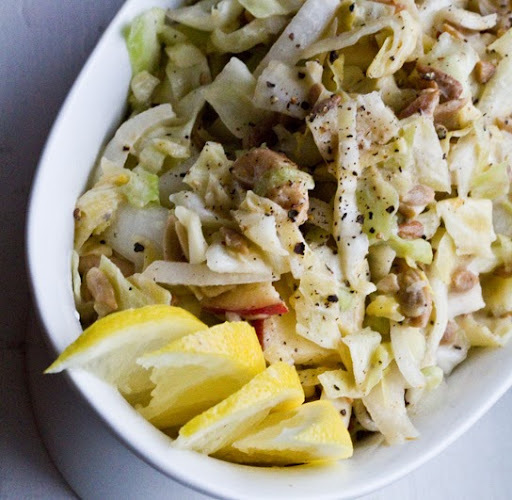 Light & Sassy Cole Slaw. Seed Maple Tempeh Cubes. 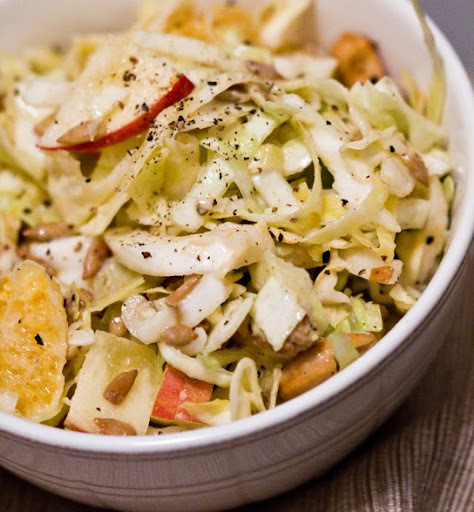 My Light & Sassy Vegan Cole Slaw tastes just like it sounds! 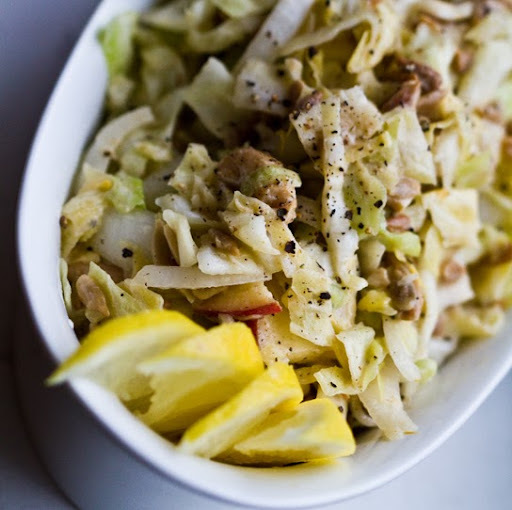 Crunchy, zesty, packed with layers of fresh green cabbage flavor mingling with citrus, tahini, tart apple, cashew, maple and cider & rice vinegar. Sometimes I let my cravings craft the recipe - and I am just a helpless pawn chopping away. This was one of those times. Enjoy Now or Later. 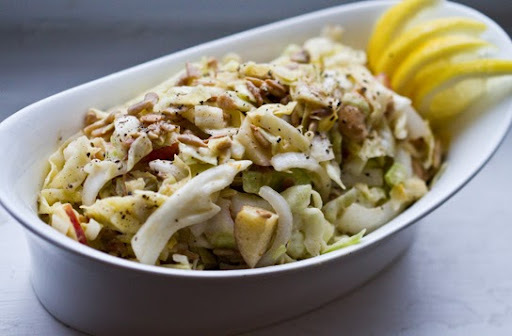 This recipe is perfect made/eaten on the spot - or even left in the fridge overnight. 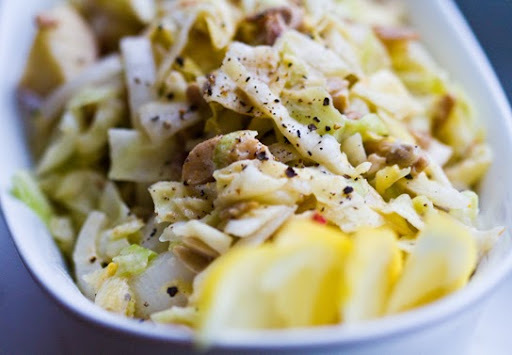 After a night in the fridge, the onions pickle a bit and the cabbage infuses with flavor. 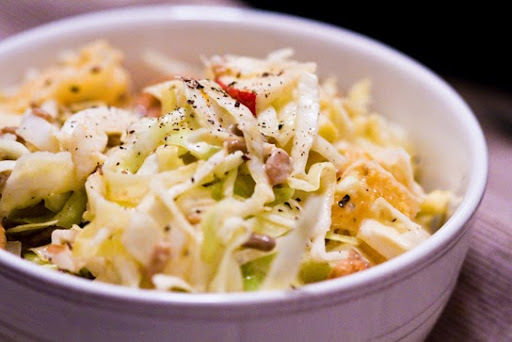 The slaw becomes less crisp - but still quite yummy. 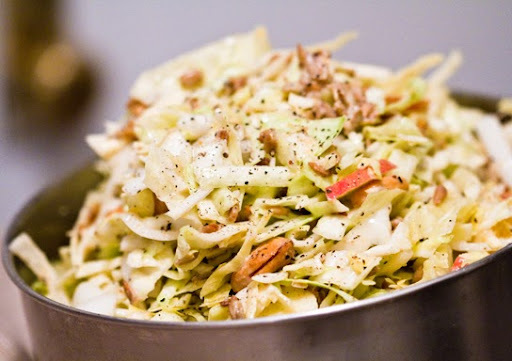 I had the slaw leftovers for breakfast the next morning. Veggies for breakfast?? Oh yes, it's all the rage, ya know. So the lesson (which is probably not new to you guys) is that when working with food photography - unless you have a pimped-out food photography studio with expensive lighting and gadgets galore - natural light is going to be your best bet. In fact, I know plenty of food photographers who have access to a pimped-out photo studio and still prefer the simplicity and elegance of natural light coming in from a window and onto a table. Window Lighting Tip! One tip with natural light from windows - if you have curtains on them (even transluscent, silky cutains) make sure they are white in color. The last thing you want is to have beige or gold-colored curtains tinting your crisp clear, white natural light a yellow-ish color. I actually added some silky see-through white curtains to my windows to give the natural light I work with a muted tone - and a bright, crisp filter. Tempeh Pairing. 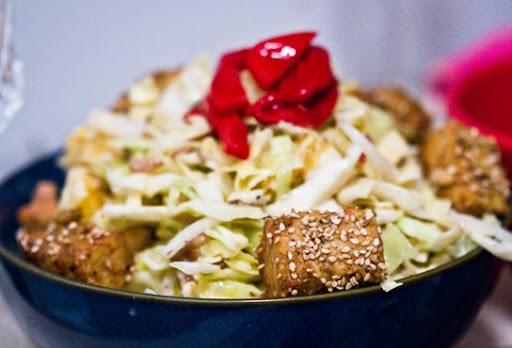 I paired this salad with a garnish of red roasted peppers and Sesame-Maple Tempeh Cubes (aka, croutons). I added the recipe below for you as well! 1. Prep all your ingredients. 2. 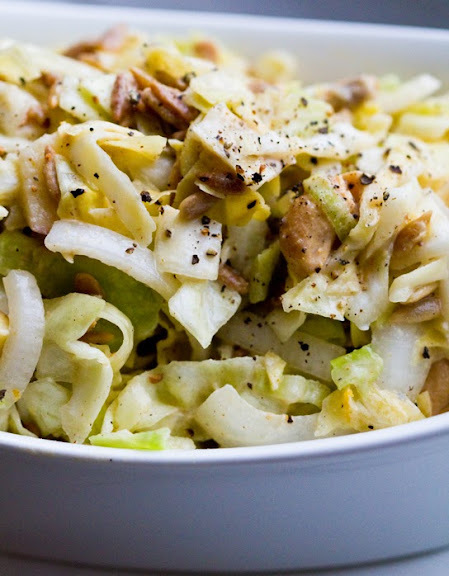 Cole Slaw is simple: get an extra large bowl and toss all ingredients very well. 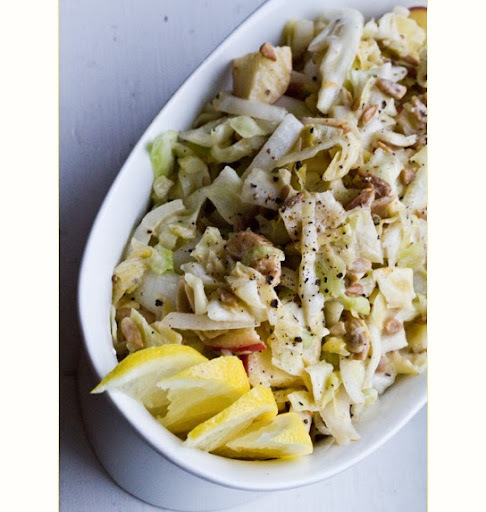 The volume will reduce as the liquids absorb into the cabbage. Store in the fridge until ready to serve. 3. The tempeh is also simple. Add all ingredients (except sesame seeds, pepper, extra water/OJ, and optional spices) to skillet. Saute on med-high until liquids are absorbed and browning begins. Usually 2-3 minutes. 4. Add in the water or OJ (nice burst of steam should occur when added) - this will steam the tempeh and moisten it a bit. Toss tempeh in pan with the additional optional spices. I also like to add an extra splash of vinegar right at the end to deglaze the pan. 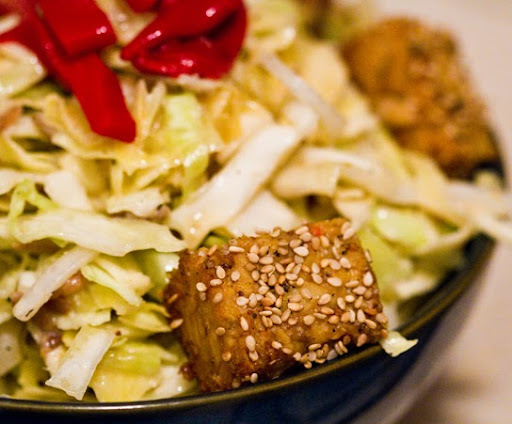 Remove from heat, toss tempeh with sesame seeds and pepper - serve. Salt to taste - after tasting your finished cubes.